This preview and the 2013 Skyd College Tour are brought to you by Spin Ultimate. As the spring season begins and the snow melts in Chapel Hill, UNC is hosting the Queen City Tune Up Open in conjunction with Without Limits on February 2nd and 3rd. In order to make this tournament successful, UNC offered scholarships (monetary and housing) to the teams in order to lessen the burden of the travel. With teams traveling from the greater East Coast to attend, the QCTU Open should be an excellent warm-up tournament for the 12 teams making the trip to Chapel Hill. The skills clinics on Saturday afternoon are one element of the QCTU Open that teams are eagerly anticipating. The clinics should provide a key development opportunity for teams attending, and will also give traveling teams a framework for reproducing these clinics in other developmental tournaments. Organized into two pools of six to allow for maximum games against opponents from different regions and efficient use of field space, there are four rounds of pool play on Saturday, and two on Sunday with the top two in each pool advancing directly to semis. 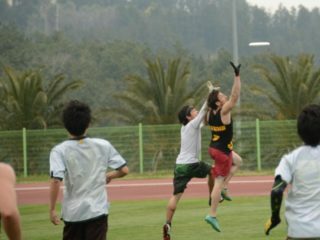 On top of their pool Swarthmore (from Pennsylvania) will face a few opponents that they have seen before, including Ohio, a team from their home region. This match-up between Ohio and Swarthmore will most likely prove interesting, as Swarthmore came out on top last season and Ohio will be looking to get a win under their belts early this year. Look for impressive cutter Courtney Phelps on Ohio and the senior class of Swarthmore, led by Sachie Hopkins-Hayakawa, to stand out in this game. Coming in second in the pool, Clemson gained some experience with their squad at CCC this fall, holding seed, and playing some close games with teams ranked above them. Although they graduated quite a few key players, their match-ups against the two teams on either side of them (Swarthmore and Ohio) should be close games, perhaps resulting in an upset. Emily Warden, a senior captain, will most likely be pivotal in Clemson’s success. A sleeper in this pool, Wake Forest broke seed at the Wolfpack Invite with their persistent athleticism and willingness to take risks deep–don’t be surprised to see them rely on their deep game again at this tournament. Liberty has a few new solid new players, and this tournament may be the opportunity they need to hash out any problems they may have been having with an inexperienced handling squad. On defense, Liberty will try to contain teams with their impressive zone, and it will be interesting to see how teams respond early in the season, when they haven’t had much time to work on zone offense. Rounding out Pool A is the host team, UNC B. They will be looking to build up their game-time skills, and this is an ideal tournament for them to do so. Under the coaching leadership of Ozone’s Kate Leslie, they may find themselves in some close contests. Coming in ranked second overall, Vermont is traveling south with a very skilled squad to take on a relatively southern pool. With a solid finish at Huck a Hunk of Burning Pumpkin, and very skilled rookies who all played in high school, Vermont is a favorite to make it to finals. Under the leadership of Lauren Beacher (2010 U20 Junior worlds player and 2011 All Region player), Vermont should take pool B, but definitely with a few close games. Carleton-B, traveling the farthest to get to QCTU Open, hasn’t faced any of the teams in their pool, but seems to have a very strong team this year. With a large pool of both handlers, down field cutters (led by the ever-elusive Lucinda Robinson) and a fast rookie class, Carleton is looking to upset Vermont as well as improve for their upcoming spring season, as they have their sights set on a D-III National Championship this year. The rest of pool B pits four teams in matchups that could go any way. Duke has some new, unexpected talent in Adrianne Soo, a convert from the Varsity Track and Field team. Be prepared to see Soo go deep frequently, which could rival the similar deep game in College of Charleston’s (CofC) high-octane offense. Virginia-B boasts a strong backbone, with a large group of upperclassmen providing a solid foundation for the younger appendages to flex themselves and grow stronger as a team. Georgia State rounds out the B Pool, and will match up against several teams they have never met before. Come out to watch some good ultimate–it should be an exciting couple of weeks in North Carolina with QCTU Open in Chapel Hill followed by QCTU in Charlotte! In addition, come see the showcase games between Pleiades (UNC’s A team) and Phoenix, as well as Darkside (UNC’s Men’s A team) and Ring of Fire on Friday night.